I was saddened last month to learn of the death of Roger Vaughan (1948-2015), whose extensive collection of Victorian and Edwardian photographs enabled him to create a very helpful array of online material. I had been unaware of his career as a geologist until I saw an obituary in The Geological Curator (July 2015, vol. 10, no 3, pp. 143 & 144). A security issue is currently making Roger's latest web pages inaccessible at RootsWeb but some have been preserved, at least partially, by the Internet Archive and more links are active from his 2012 index page. Roger's pioneering analysis of the "Marion Date Code" on mounts manufactured at Marion's imprimerie in Courbevoie, Paris, is still available at http://www.cartes.freeuk.com/dated/mip.htm. I assume that page would have been updated after 2003 if he had gleaned any further insights into the enigmatic dots and dashes printed near the words Marion, Imp. Paris. It would be interesting to know if anyone else has investigated their significance. My own brief study of a relatively small sample of portraits has failed to confirm the existence of an annual date code. Although some sort of evolving trend is apparent during the course of the 1880s and 1890s, there are often far less cryptic indicators of earliest possible dates, such as registered designs. Several of Marion's mounts are featured on Roger's 2005 web page entitled Marion - Victorian Photograph Card Printers. 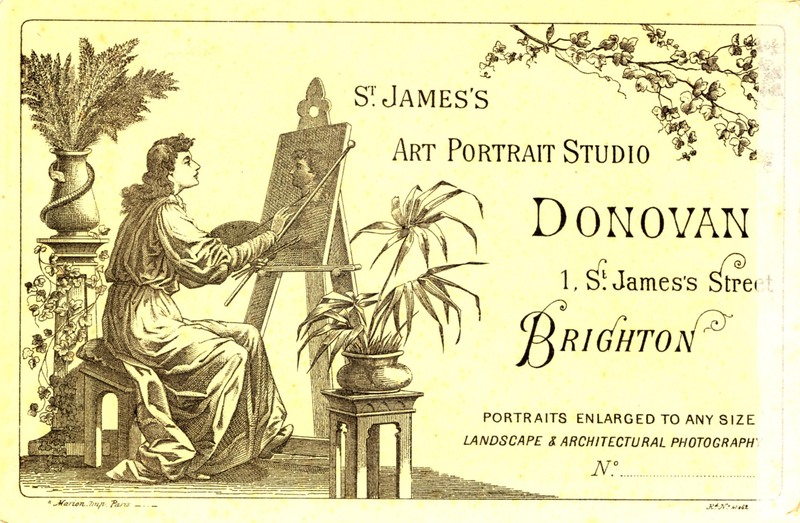 I wonder whether the first of the designs illustrated there, dated c.1870, was among the copyright applications made by Marion and Company in October 1867 (soon after the dissolution of the old firm of A. Marion, Son, and Company) to register the drawings for cartes de visite numbered 590-598 & 600, which have been catalogued by The National Archives (TNA) as COPY 1/13/853-865. Has anybody examined these at Kew? Roger's observed dates of usage in the 1890s for four of Marion's registered designs (listed at the foot of his page) could be misleading. TNA's catalogue shows that 41055, 41057 and 41062 were registered at the Patent Office in January 1886 (BT 50/55 & BT 51/20) and 161785 in November 1890 (BT 50/147 & BT 51/62). Links to examples of those designs are included in the following list, along with a few others I have come across. Rd No 41055 Brambles & ivy-leaved morning glory (?) or "berries and vine"
* In case I am misreading the number (circled in the attached extract) I hope someone can find a more legible copy of this design. 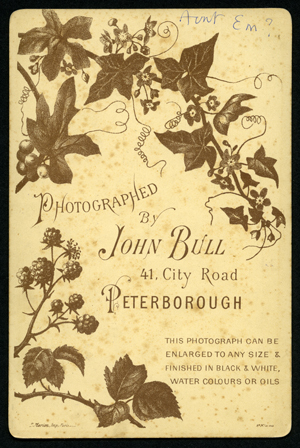 If it is close to 309164, it was registered in November 1897 (BT 50/300), two months before a new address was advertised by the photographer, Louis Urbinsky of Norwich. His mounts appear to challenge the accuracy of 1899 for ''Marion Imp.Paris''_.._ (unless I am wrong to equate that with Roger's - MIP - . -). The previous decade seems equally unlikely, since Urbinsky was elsewhere until 1889. Was it really a date code? Did Marion put similar marks on other products? If this was the company's discreet method of identifying particular batches or employees (who may have been neither inflexible nor infallible in their application of the code) what was the advantage over simply adding sequential numbers or initials? While such questions remain unanswered, perhaps we should be even less dogmatic than Geoffrey Rush's Captain Barbossa, one of Disney's Pirates of the Caribbean, when he said "the code is more what you'd call 'guidelines' than actual rules"! Ron Cosens has kindly supplied two examples of the last of the registered mount designs I listed last month, featuring a scroll and tracery, which was popular from the late 1880s to the mid-1890s. One used by Louis Urbinsky is clearly dated 1895. The Rd No is not so clear but appears to be between 108154 and 109964 (certainly not 309164). Those numbers were registered in 1888 (September or October: BT 50/106 & BT 50/107) so it is possible that the code _.._ relates to an initial production date of 1889 for the attached design, although Urbinsky was using a different style of mount for some time (possibly several years) in the early 1890s. I look forward to any further images or thoughts on this topic.